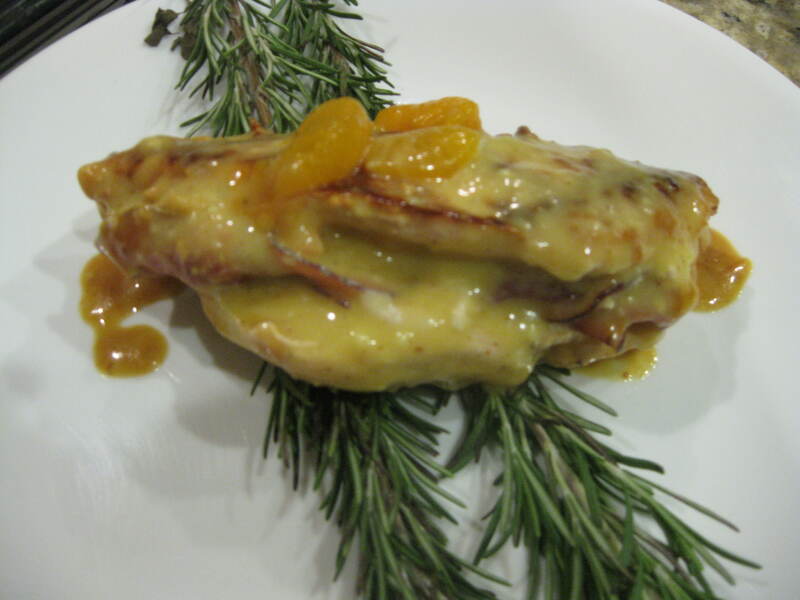 This chicken recipe sounds fancy and it makes a beautiful presentation, but it is really easy! Here I put it over some rosemary (my oldest daughter asked why I was putting it over some of the Christmas tree) to make it look good. It is a recipe I got from a free Campbell’s recipe book in a grocery store many years ago, but again, I have adapted it a little bit. Cut a pocket (making sure both sides are equally thick) in each chicken breast. Stuff each with about 3 slices of lunchmeat and 1 slice of cheese. Heat olive oil in a skillet, then add chicken and cook until it is browned. In the meantime, stir the orange juice, sage, dijon mustard, and juice from the can of mandarin oranges together. When the chicken is cooked, pour into the skillet and let simmer until the sauce is hot and becomes a little more transparent. Add the mandarin orange segments just before you serve. This would be a great entertainment recipe for a Christmas party! I’ve served it with mashed potatoes and gravy, some simple but beautiful noodles, or a side of a green beans and chopped almonds. All are great!